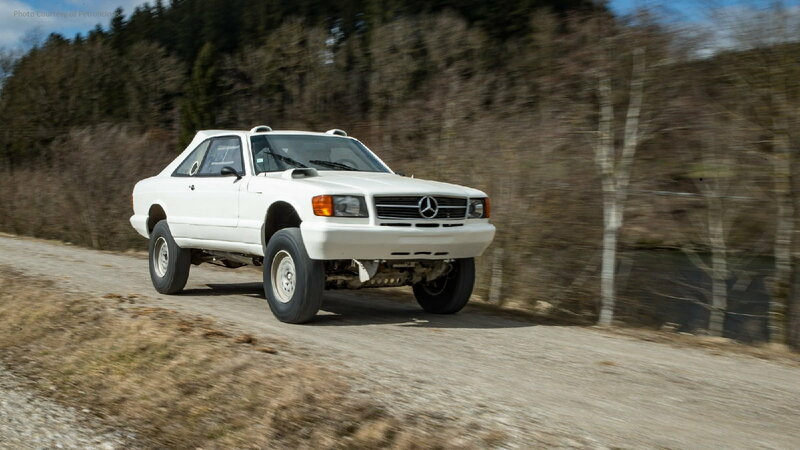 Slideshow: A relatively unknown Mercedes originally built for the strenuous Dakar Rally resurfaces after being purchased in an international internet deal. 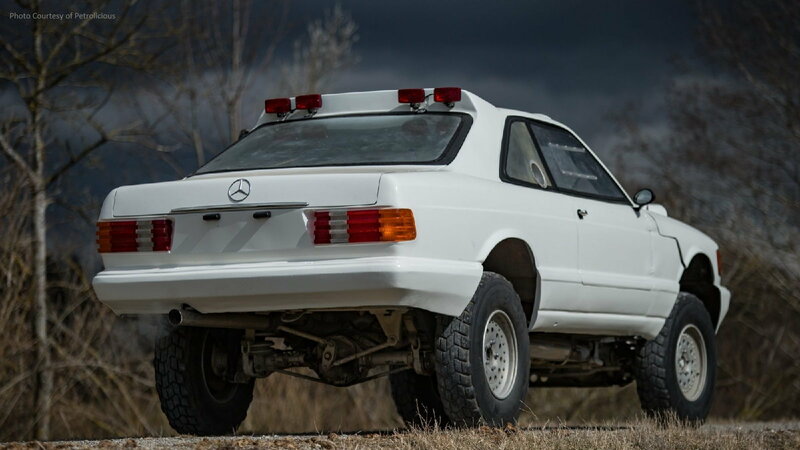 Like many petrol heads, Hans Jurgen Rauch, the owner of a respectable quad & four-wheeler dealership in southern Germany, found himself browsing the internet one evening for cool bits of machinery when he happened to stumble upon an ad for this monstrous 80's Mercedes 560 SEC. Although he is not particularly fond of Mercedes vehicles, Hans was intrigued by the car and soon found himself headed to France with a trailer in tow to buy it. He could not seem to find any information on the car on the internet but hoped the seller would fill him in on its history upon arrival. After a lengthy drive, Hans arrived at the seller's place only to find a huge communication barrier. To make matters worse, the car was very far from its advertised condition with damaged body panels and a wild rainbow paint job. The seller also knew nothing of the car's history, but Hans had driven such a long way that he wanted to try to make a deal happen. Apparently, the two parties flailed their hands at one another for several hours until the price was reduced to a point that Hans felt comfortable with and he loaded the Merc up and hauled it back home to the Fatherland. >>Join the conversation about the 560 SEC Paris-Dakar Rally car right here in MBWorld.org. 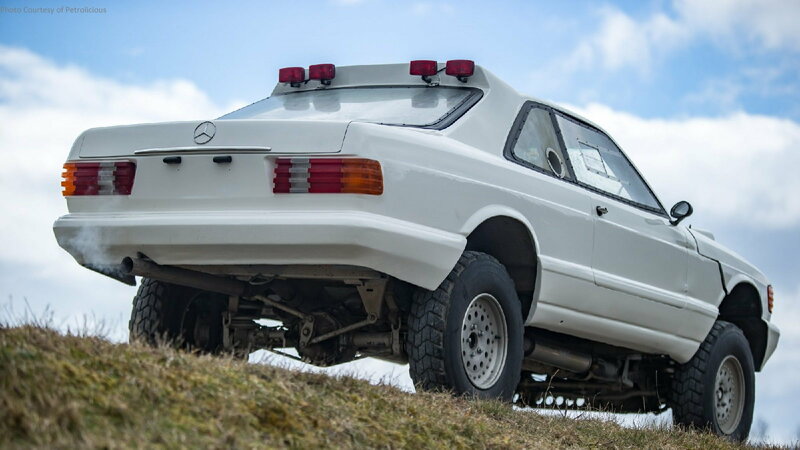 Hans returned home with the Mercedes, and although he had no immediate plans for it, a closer examination of the car showed that it was not just some novelty vehicle, but a serious off-road build. For starters, Hans found a complex secondary frame to allow for mounting of the body to the G-Wagen chassis. The body, despite its flaws, was skillfully crafted with fiberglass to exactly mimic a 560 SEC. The clamshell hood alone, which encompasses everything from the front bumper to the beginning of the door panels, is quite a work of art. 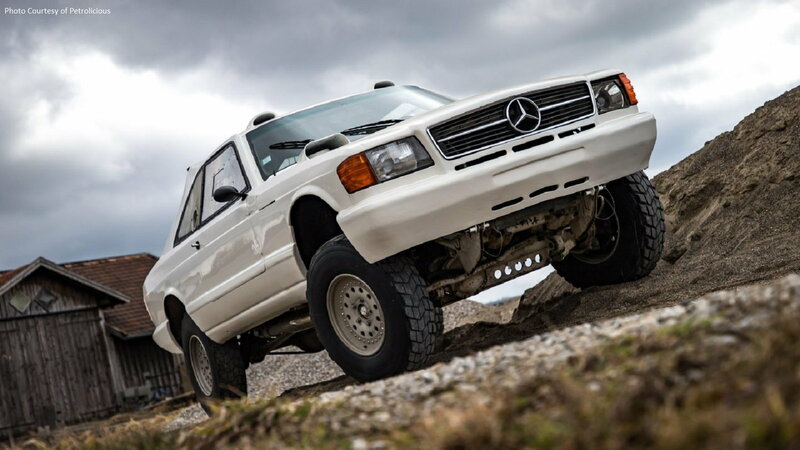 The suspension has obviously been heavily modified but is quite unique as it pre-dates coilover suspensions found on modern-day off-roaders. 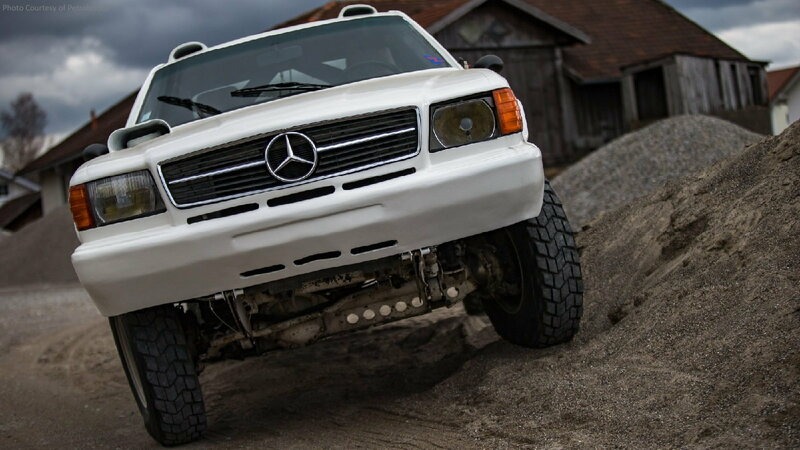 The standard shock towers have been replaced with specially fabricated units that utilize a double shock mount to keep the strengthened G-Wagen axles (with early air-lockers) under control. A cool feature is that instead of using a compressor to air the tires back up when switching terrains, the chassis rails are actually sealed thus allowing them to double as air reservoirs. This 560's interior is filled with outdated navigation equipment that may have been cutting-edge in its day but now looks like ancient 80's Nintendos. 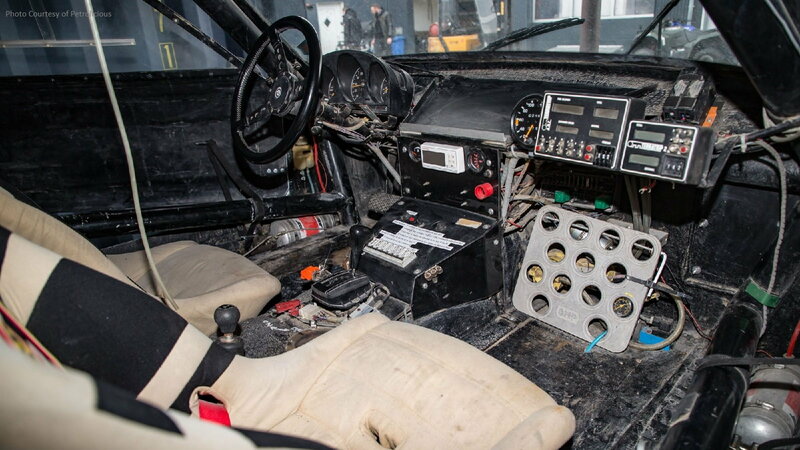 The seats are dated lightweight racing buckets that would seem to offer absolutely no comfort in any type of rally event, and the aluminum roll cage looks to be of period ASO construction with the original fire-extinguishers still intact. In short, it is much less refined than the interiors of today's racers, especially with a seating position that will have an average person's chin resting on their knees when strapped in. Hans finds himself at a crossroads with the interior and safety as updating it to compete in any sanctioned event would cause it to lose its awesome 80's originality. 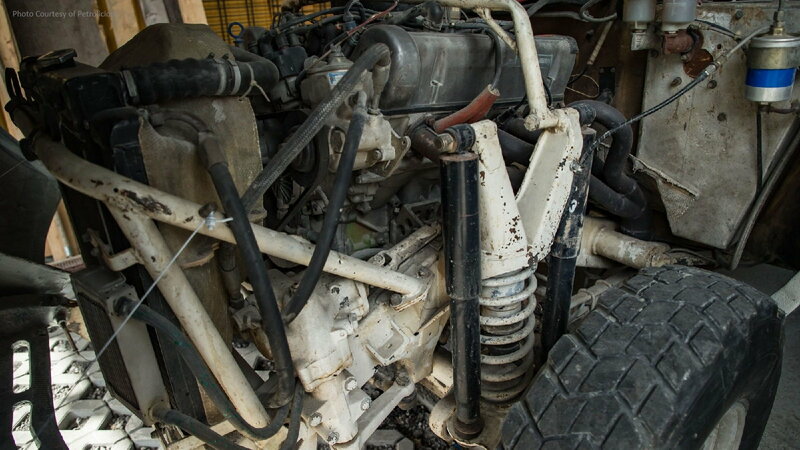 Under the clamshell hood sits an overhead cam 5.0L M117 V8 connected to what is believed to be a W3B 050 3-speed automatic transmission out of a 450 SEL 6.9 Mercedes. Although horsepower numbers are unknown, it likely produces somewhere in the neighborhood of at least 230-250hp as it did in its road-going counterparts. To fuel the thirsty beast, a 52-gallon fuel tank has been installed in place of the rear passenger seats for the extra-long stints associated with rally raids. The only information that Hans has been able to source on the car is that it was supposed to have started the 1987 Paris-Dakar Rally with Bruno De Montaigut at the helm with Richard Loze alongside, but it suffered a catastrophic transmission failure early on. Apparently, there is only a single picture of the car at the event sporting plain white paint with a simple "Lui" decal on the door. 20 years later, it competed in the 2006 Egyptian Pharaons Rally where it acquired the rainbow paint that remained on the car until it was acquired by Hans. 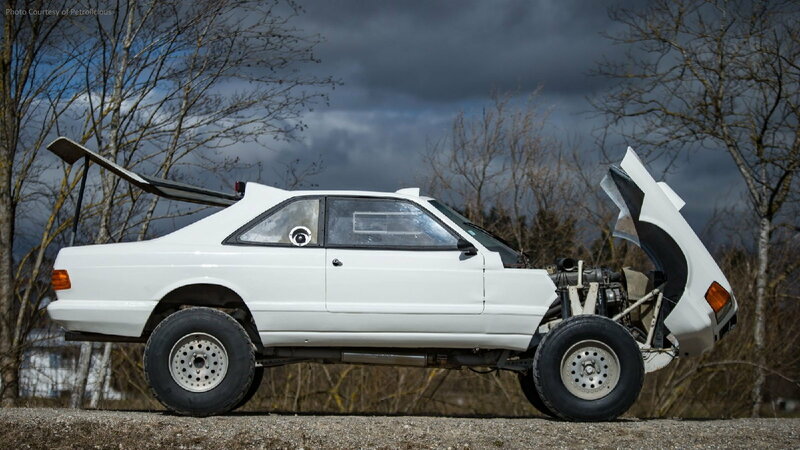 To date, Hans and his son, Roman, have repaired the bad spots in the body and refinished the car in a classic white paint scheme, replaced corroded brake system components, and installed a new exhaust setup to replace the rusted-out original. Hans would like to get the car legalized for road use, but German TÜV inspections are known to be quite strict and often require proper documentation dating back to the car's build, none of which Hans has. He hopes for it to one day be cruising the German streets, but until then, it can be a neat restoration project, remain a period showpiece, or be updated to compete in classic rally-raids.